Stair stringers create the foundation for a set of steps or stairs whether built indoors or outdoors. Stair stringers set diagonally and attach the top high surface to the ground or floor. You must use stringers in pairs, though additional stringers create sturdier staircases. Stringer length depends on both the height and run of the stairs you intend to build, as well as the intended tread and rise of each individual step on the staircase. Before you begin building your stairs or steps, you must calculate the length of your stair stringers as well as the measurements of individual steps that will set into the stringer. Measure the height from the surface where the stairs will start to the bottom surface that the stairs will connect to. At this time go ahead and measure the required length of the stairs. If there are no space restrictions, you will not have to worry about measuring the length of the staircase. Write these measurements down on a pen and paper while you are calculating the stringer length and step sizes. Divide the height of the staircase in inches by the intended rise of each step, also in inches, to assist in determining the stair stringer length. The riser height is up to you, though most building codes will not allow a height larger than 7 3/4 inches. If possible, keep the riser height between 6 and 7 inches for a comfortable step. Round up the number you receive from the calculation in the previous step. This will give you the necessary number of steps for your staircase. Write down the height or rise of the steps and the number of steps you will require. Decide on the intended tread depth or length of the stair treads from the front or nose of the treads to the back of the treads where they connect to the rise. You want to make the tread depth large enough for your entire foot to set comfortable on the step. Tread runs typically range between 8 and 12 inches, though you may require shorter or larger treads. Multiply the tread depth measurement in inches by the number of steps you are required to have and you will arrive with the required length of the staircase in inches. If you are pressed for space, you will have to measure the available space for the staircase and consider building a jointed staircase if there is not enough room available for the stairs. 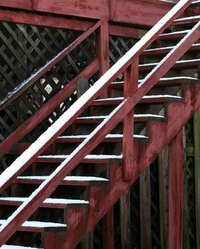 Use the Pythagorean Theorem to determine the necessary length of your stringers using the height and length measurements of your staircase. The Pythagorean Theorem helps in determining the hypotenuse of a right triangle, which you will create invisibly with the height and length of the staircase combined with the position of the stringers. Square the height of the stairs and the length of the stairs in inches and add those two values together. Find the square root of this final value. Round this amount up to the nearest inch and you have the stair stinger length. Use the tread and rise measurements you chose to use in calculating the length of your stair stringer when you begin cutting the notches into the stringer board.